In 2009 at the World Forum for Early Childhood Care and Education in Belfast the idea of International Mud Day had its beginnings. 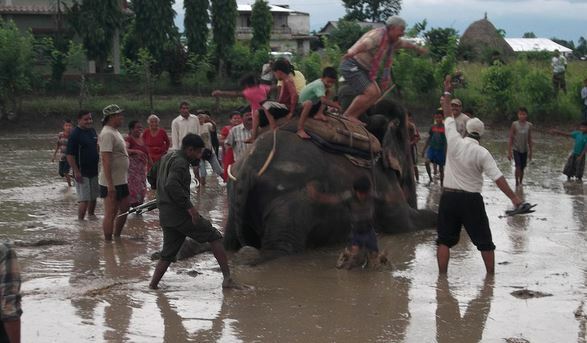 Two members of the Nature Action Collaborative for Children, Gillian McAuliffe from Western Australia and Bishnu Bhatta from Nepal, discussed the challenges children faced when playing in mud in each other’s context. Gillian reflected on the lack of mud as Perth is situated on a sandy plain and also the reluctance of the culture to ‘get dirty.’ Bishnu on the other hand had lots of mud but many children did not have enough clothes to be able to get them dirty or soap to wash them. On her return to Australia, Gillian who is the Director of Teaching and Learning at Bold Park Community School, told this story to a group of seven and eight year olds. The Bold Park children decided they could send clothes to the children in Nepal so that they could play in the mud. They raised $1000 in three weeks and sent it to Bishnu to buy some clothes for some children there. So in September 2009 Bishnu did this and arranged a special day for the children of the Panchkhal orphanage which included their first meat meal in five months. Since then the two groups have celebrated a very special bond and played in the mud together, although in different countries. Four years later,in 2013, a group of six families from Bold Park are traveling to Nepal to take part in Mud Day celebrations with the children of Nepal. They have also raised money to complete a renovation project at the orphanage. At last, they will play in mud together in the same country. And perhaps, at some point, some of the children from the Panckhal orphanage in Nepal will visit Australia to celebrate Mud Day with Bold Park Community School. 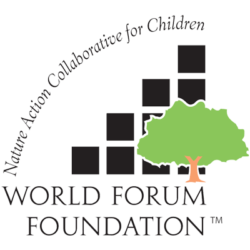 The World Forum community offers the opportunity for us all to connect in such wonderful and surprising ways, building global understanding and relationships. What began as an exchange between the children of Nepal and Australia, is now an idea shared throughout the world. Click here to view reflections from Bishnu and Gillian in a 2010 issue of Wonder. International Mud Day is right around the corner! Join others around the globe in a day of splashing, rolling, squishing, sliding, making mud pies, and more! It’s time to plan and spread the word about how you will celebrate. The Nature Action Collaborative for Children offers a number of resources for planning your Mud Day, including articles, books about mud, and logos to use in your newsletters or websites. The Mud Book – Based on the premise that “we believe it’s okay to get dirty,” Discovery Children’s Center shares their mud play area and adventures in text and full color photos. Click here to download it. Jan White Blog – Natural Play, Natural Growth, in the Early Years. Jan advocates and supports high quality outdoor provision for services for children from birth to five. ModderDag – Read about a Dutch Mud Day. Mud Day Song – The staff and children at Bold Park Community School wrote a song! Who Likes Mud Book – Written by NACC Leader, Swati Popat, Who Likes Mud is a story that explores the world of mud, the animals who like mud, a seed that needs mud and worms that make it matter! Click here to download the PDF, or visit Amazon to purchase a copy of the book for your enjoyment! Download the logo and use it in your media to promote International Mud Day! Tentative explorations begin with single fingers poked into soggy soil or sticks dipped into gooey muck and then… finally… a splatter is made, a giggle erupts and before long…gleeful squeals of pure delight ensue as the players (both children and adults) let go of their trepidations and literally jump in with both feet! Your stories also speak of deeper messages that convey the lasting impact Mud Day will have; messages of freedom, creativity, exuberant play, community advocacy, and the importance for our world’s children to connect to the Earth and to each other. Share your stories of Mud Day with us! Click here to email us how you will be celebrating Mud Day this year.